So, with time being in a bit of a crunch, and sleep being at a premium, I ran out this afternoon to go see one of the two movies that I promised to write reviews about this week. 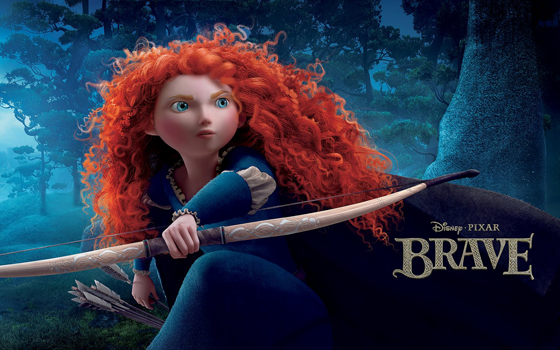 And since Abraham Lincoln: Vampire Slayer was sold out (not really) I decided to see Brave instead. Continuing on my previous post, will this be another hit, or another miss? Check it out, after the jump. Continuing in the long Pixar tradition, (can this really be classified a long tradition?) The film starts out with a short film, this time the short is "La Luna". It's actually a wonderful little piece, that plays on tradition and individuality. Honestly, I think the film set up the feature brilliantly, and found it to be a decent short. The feature itself, was visually everything I could have hoped for. Visuals that manage to stun, and inspire awe. Once again, the masters at Pixar have managed to craft a world that is visual perfection, with colors that manage to either pop or be subdued perfectly as the scene requires. There was never a moment when the film felt dull, or uninteresting. And just like a good soundtrack can set make or break the mood, so too can the proper color palette. Massive props to the art department. Speaking of soundtrack, the film has a great soundtrack. Sure, it is full of bagpipes, but it evokes the proper mood, and frankly... It just feels properly Scottish. I could honestly, sit back and just listen to this film, and still find it perfectly enjoyable. And that right there, is a testament to the sound department. The story though... the story itself is beautiful. It is a fairy tale that at once feels deeply familiar, like a nostalgic moment from childhood, and also new, and refreshing. It has enough action to keep the lads happy, and also has enough girly-ness to keep the lasses happy. It has humor, heart-break, and horror. It excites, it wrenches at your heart, and it rewards you in the end. Honestly, I do not think I could sing the praises of this film enough. The writers won me over. Recommendation: See this film. If you have kids, bring them along. If you don't have kids, bring a date! If you don't have a date, go alone! This film deserves as many viewers as it can get, and I can not stress that enough. Is it Theater-Worthy: Yes. I can't attest to the 3D aspect, but I can say that the film was a visual triumph, and felt pitch perfect in the theater. Will I still be buying it on Blu-Ray? You better believe it. This is a film that warrants multiple viewings. Final Thoughts: In the end, when it is all said and done, the biggest compliment I can ever give a film, is paying for another to see it. This is a movie that I feel I must put my money where my mouth is, and I have already given money to a few people with the express purpose of having them see it, as well. This movie was beautiful, straight up, one of the best animated films I have seen in a long long time. Pixar has outdone themselves.